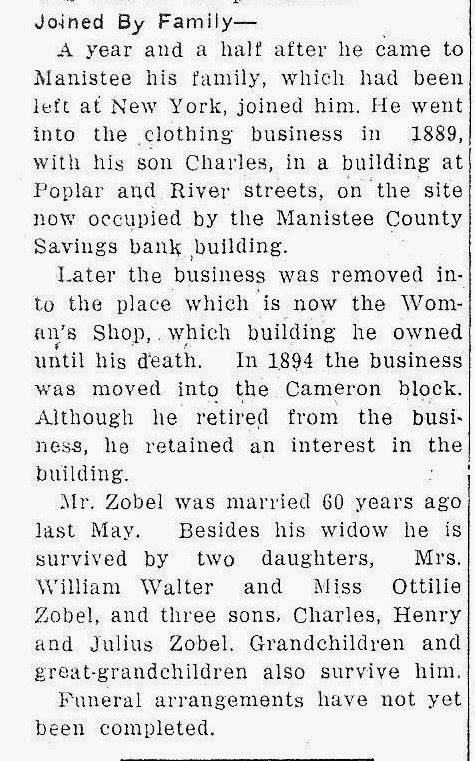 I would love to have a detailed obituary on every one of my ancestors like the one I found for John Zobel. John's obituary provides details of where and when he came to Manistee county that genealogists love to read. His obituary goes beyond the dates and places by sharing stories. The only piece missing that would be helpful was the name of his wife. Most days I am thankful for finding any type of obituary for my ancestors. John Zobel was the husband of Henriette Fredrich Zobel, my great grand aunt. 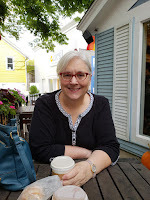 It was through my research of Henriette's marriage that I found information about her parents, my second great grandparents, Christoph Fredrich and Susanna Koenig. I still remember the excitement I felt when I found her marriage record. John Zobel died 31 October 1921 in Manistee, Michigan. Below, in two parts is John Zobel's obituary with transcription. Source: Manistee News Advocate-Manistee Daily Advocate, 31 October 1921, front page, column one, newspaper owned by Manistee County Historical Museum. In the death at 8:30 this morning of John Zobel, 182 Lincoln St., Manistee lost another pioneer. He had lived in Manistee 51 years and was 87 years old. Death was due too general debility. About a year ago Mr. Zobel fell critically ill with pneumonia, but recovered. Later he began ailing and for the last five weeks had been in bed. He was able, however to be up for a short time Saturday. Mr. Zobel 32 years ago opened the clothing and shoe store which is now operated by Charles Zobel & Sons. He retired from business 13 years ago. Mr. Zobel was born in Guhringen, West Prussia, Nov. 23, 1834. He came to the United States in August, 1870, and a month later moved to Manistee. For a year he worked in the lumber woods, when he suffered an accident. He was in the woods during the big Manistee fire. His trunk and belongings were buried in a pit by his boarding house landlord, at the mouth of the river. When he came down from the woods he found the trunk but the contents were gone. The trunk was still in his possession. A year and a half after he came to Manistee his family which had been left at New York, joined him. He went into the clothing business in 1889, with his son Charles, in a building at Poplar and River streets, on the site now occupied by the Manistee County Savings Bank building. Later the business was removed into the place which is now the Woman's Shop, which building he owned until his death. In 1894 the business was moved into the Cameron block. Although he retired from the business, he retained an interest in the building. Mr. Zobel was married 60 years ago last May. Besides his widow he is survived by two daughters, Mrs. William Walter and Miss Ottilie Zobel, and three sons, Charles, Henry and Julius Zobel. Grandchildren and great-grandchildren also survive him. Funeral arrangements have not yet been completed.